Ideal for injuries and sprains of the quadriceps, hamstring, or groin muscles. 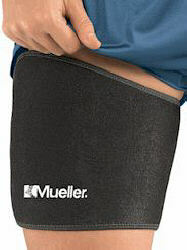 Easily adjustable thigh support provides warmth and compression to the quadriceps and hamstring muscles. Unique contour design allows this thigh support to be placed directly on the thigh or higher up to support the groin. It is ideal for injuries and sprains of the quadriceps, hamstring, or groin muscles. Wear to warm muscles before strenuous activities or all day for constant, adjustable compression. Soft neoprene blend retains body heat for increased circulation to relieve pain and promote healing. Adjustable, contour design allows for comfortable fit. One Size Fits Most - Fits thighs 15 - 35" (38 - 88 cm).